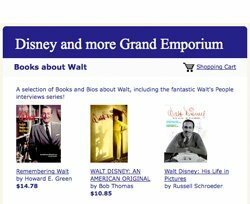 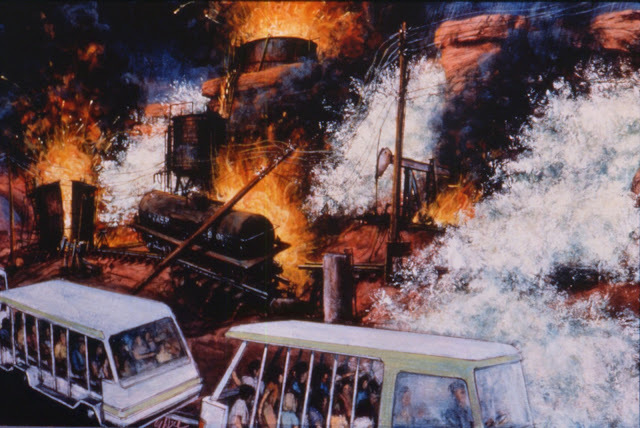 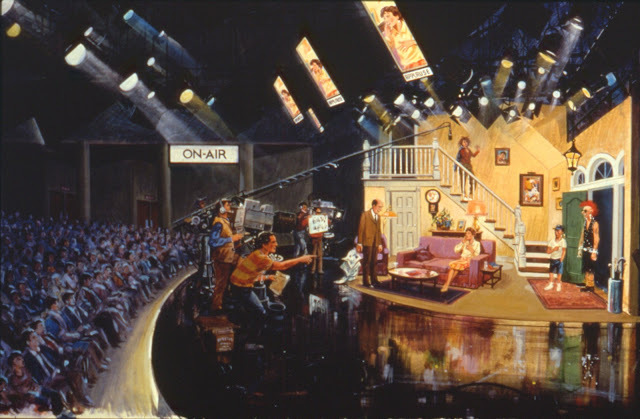 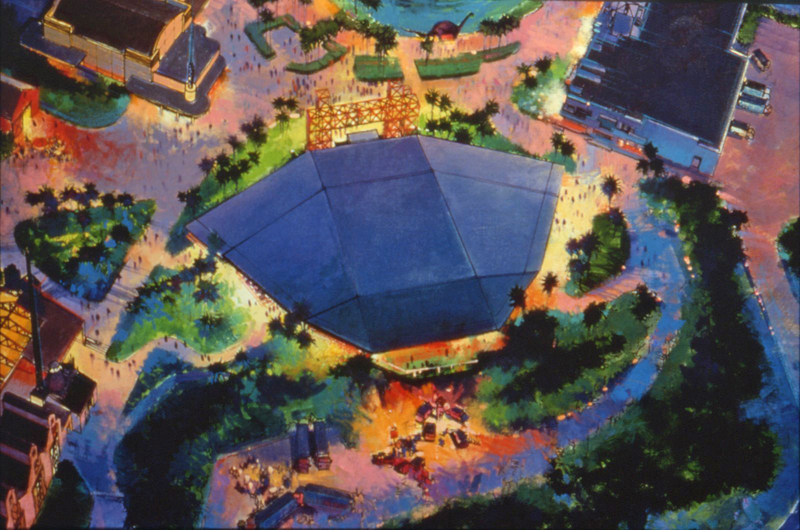 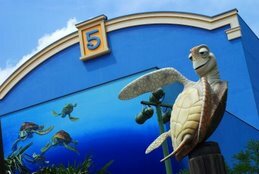 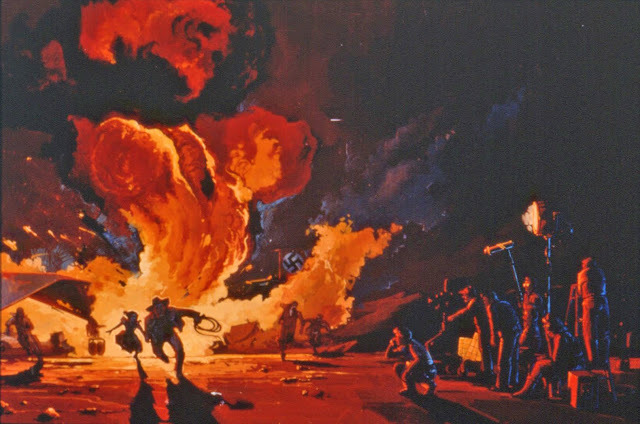 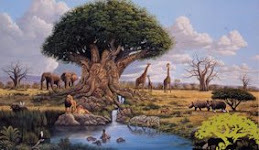 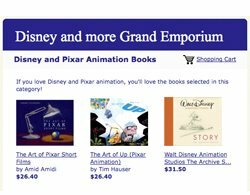 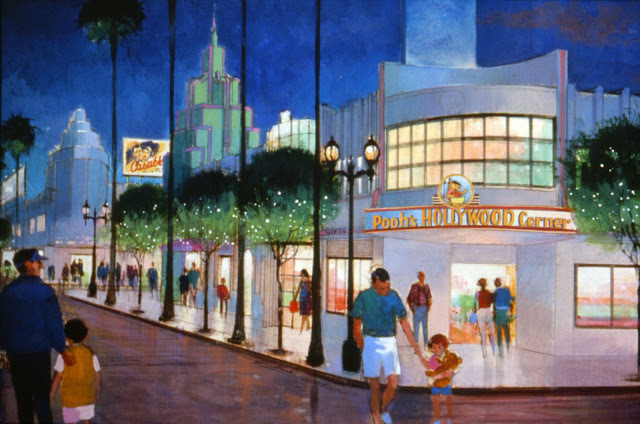 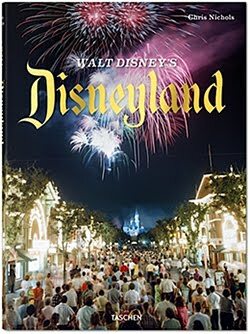 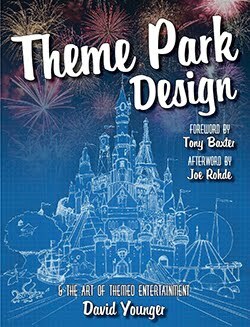 The Disney Hollywood Studios celebrate their 30th Anniversary on May 1 and D&M join the celebration by a series of articles with most of the original artworks done for the park at a time he was known as Disney MGM Studios. 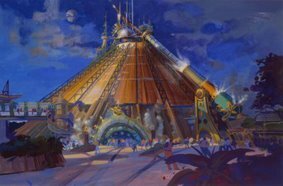 And it's not simply a copy and paste of a D&M previous article as most of the pictures have been enhanced and are now with accurate colors, better contrast, etc, in two words it's the best version ever of this article. 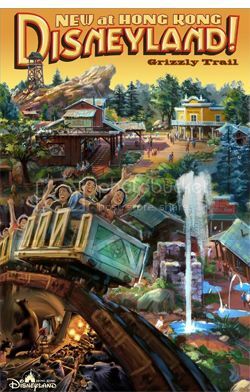 So, here is the part one with lot of original artwork, and probably many that you will see for the first time. 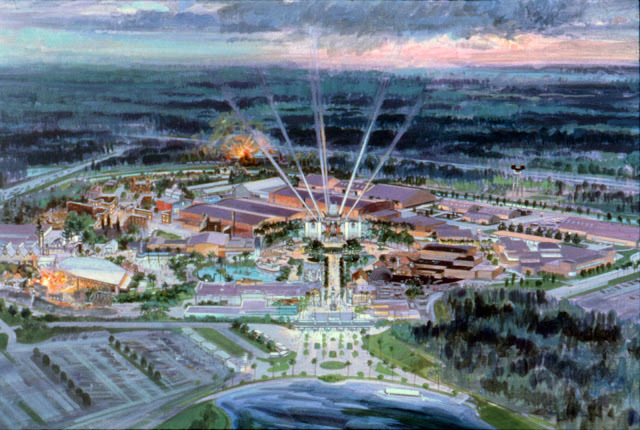 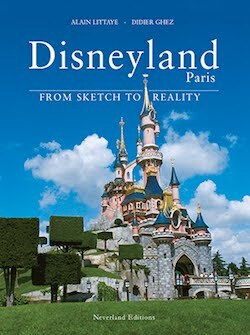 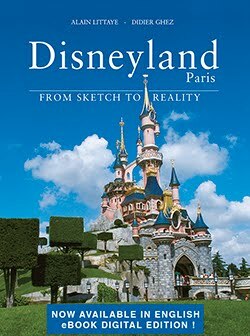 The first one below is of course a park overview, without the Sunset Boulevard which will be added later. 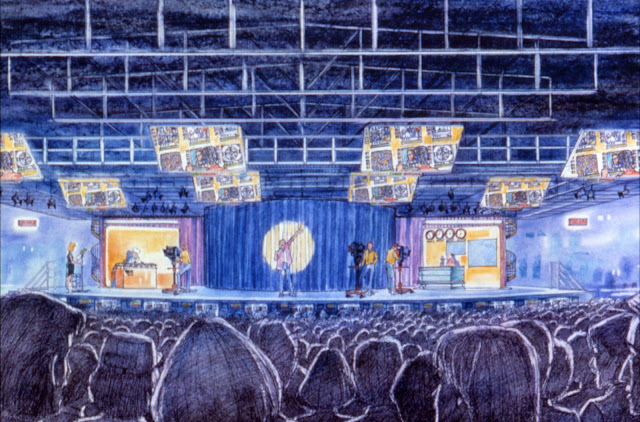 Now, here are some interesting renderings, and they show the backstage walking tour during which guests could view real productions from behind a glass wall. 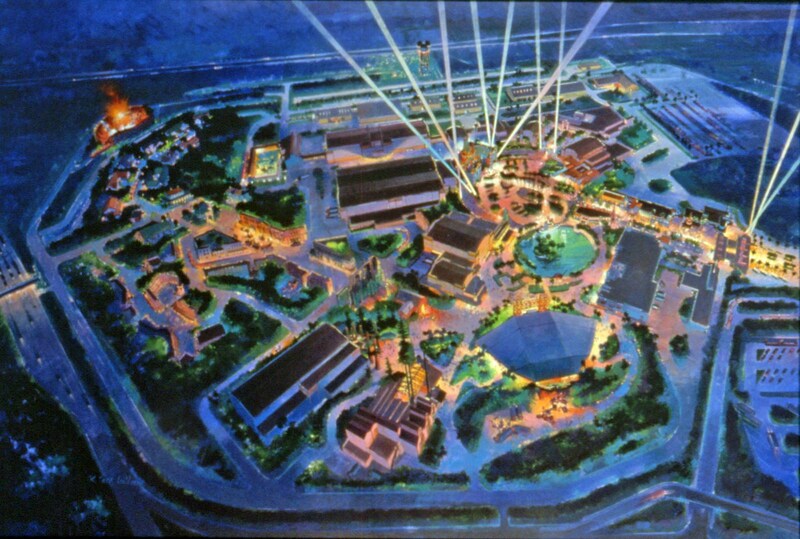 All this ended when real production stopped. Here is another rendering for the same walking tour. 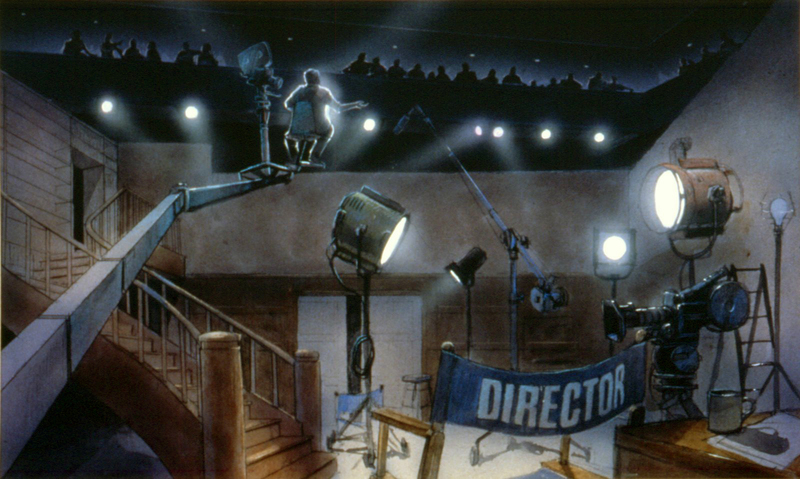 ...and the sound effects theatre stage was recording stormy horror movie effects as I recall. 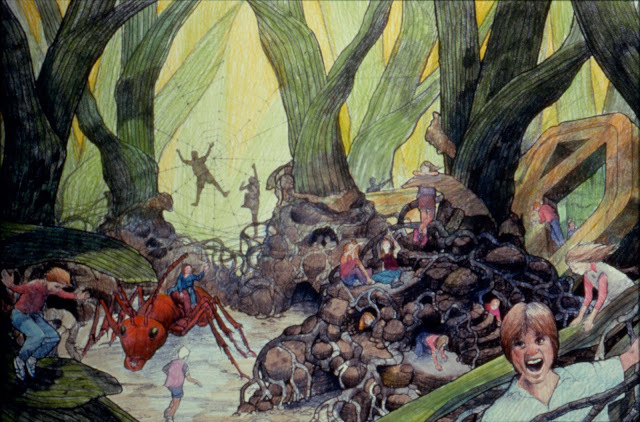 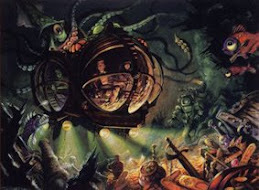 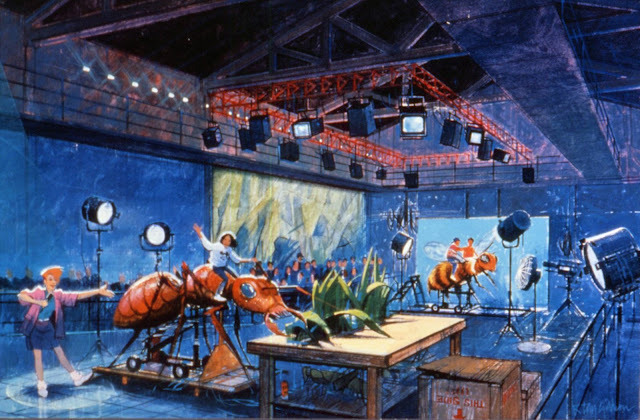 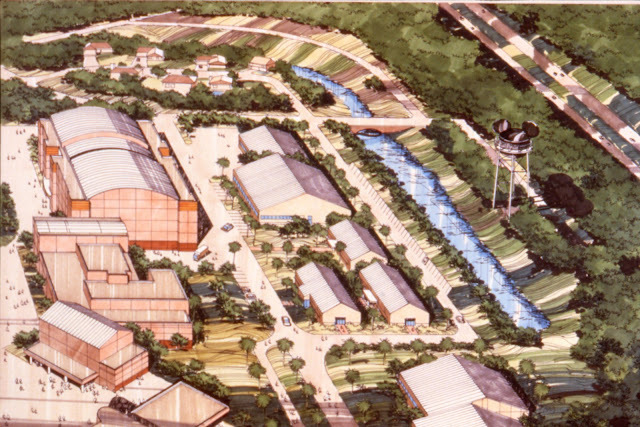 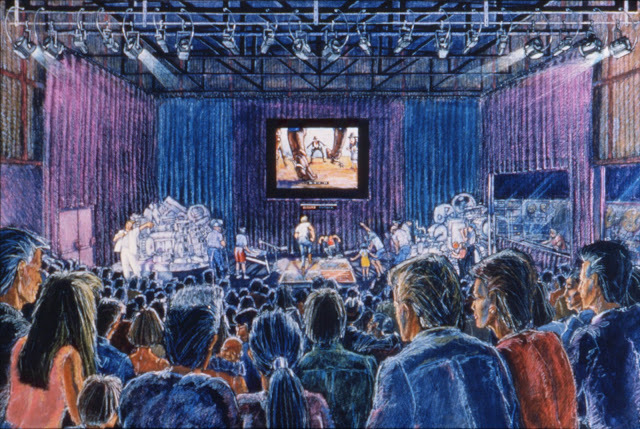 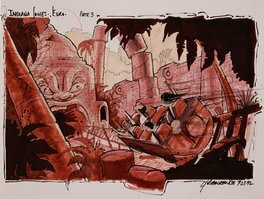 This rendering is also related to the walking tour for a visual effects experience during which guests could sit on giant ants or bees - based on the Honey i shrunk the kids movie - and see their footage include next in the background. 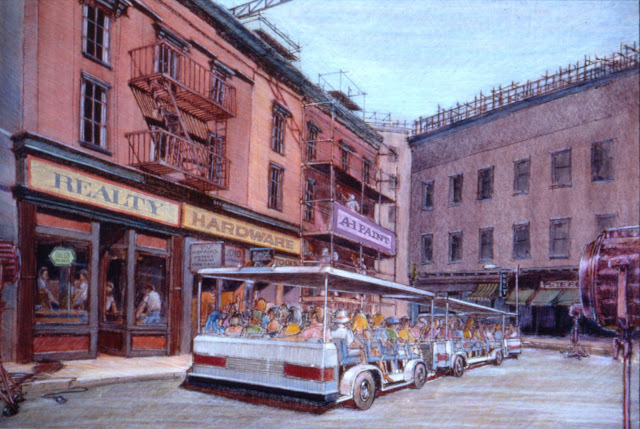 This next artwork is for the Tram Tour on the New York street. 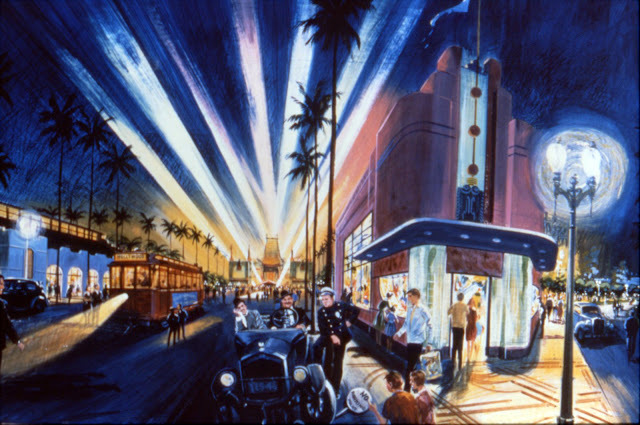 I'm adding here the original part two of the article, with a tribute to the Great Movie ride and the Chinese Theater replica with original artwork and great behind the scenes photos of imagineers at work. Above is the artwork for something that was probably a mural painting, and below a rendering of the Chinese Theatre area. 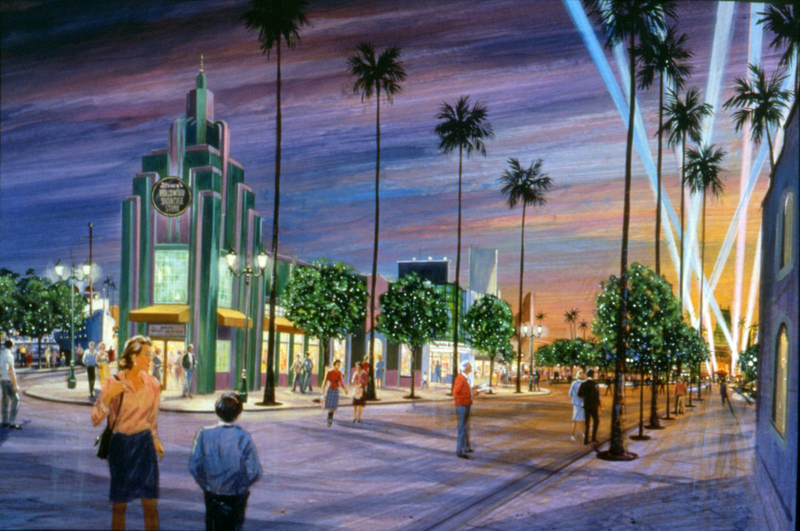 Another one of the Hollywood Boulevard with the Chinese Theatre in the background. 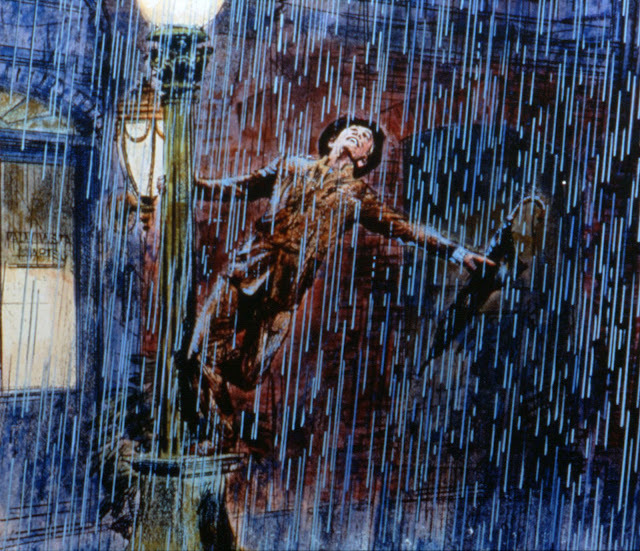 Here is a rare rendering for the Singing in the rain scene. 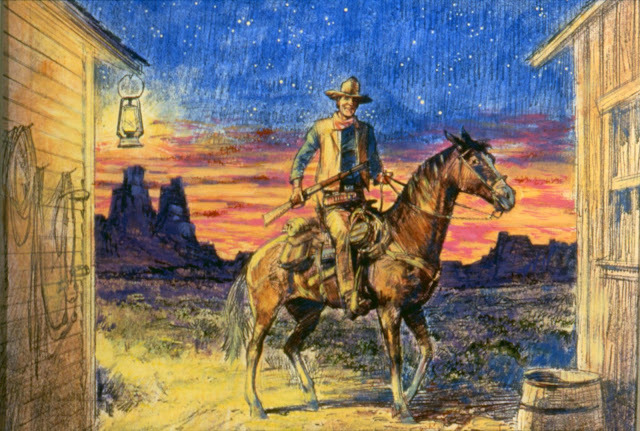 And of course, this one is for the John Wayne scene. 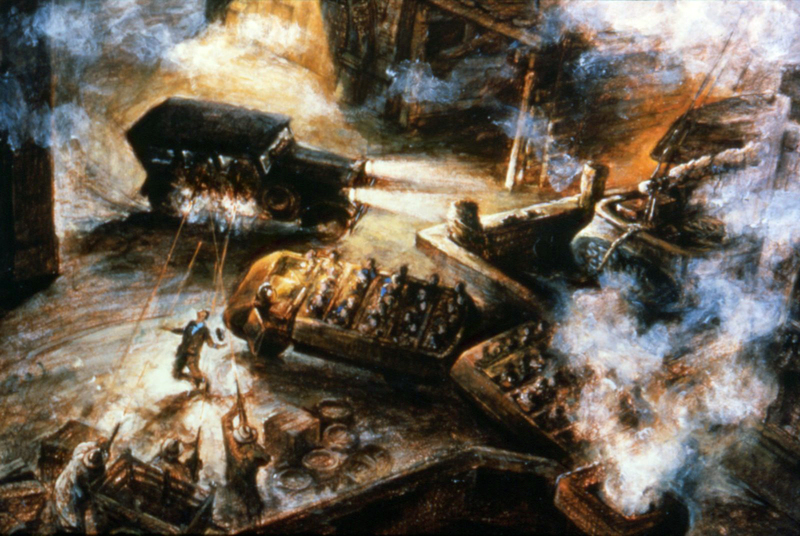 Here is the artwork for the gangsters scene. 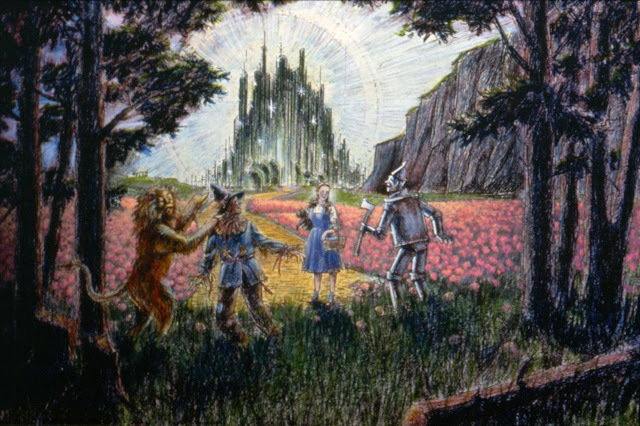 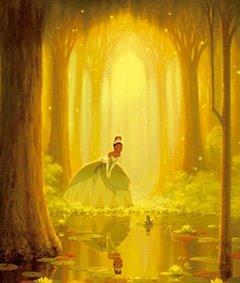 And this is the rendering for the final Wizard of Oz scene. 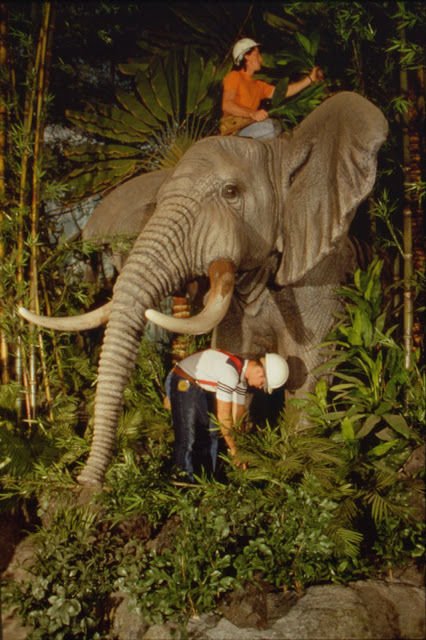 "The Casablanca scene has the real Casablanca Lockheed Electra plane used in the movie - and the tail section is in the WDW Jungle Cruise. 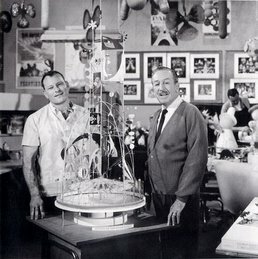 The plane was located by Malcolm Cobb of WDI/ California, in Texas. 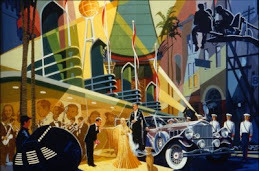 Malcolm got the Lockheed registry of all the planes and their history and present owners and set out looking. On this Texas plane, no one had any idea it was the real plane until they ran its serial numbers and found it had been registered to the movie studio that made the film at that time. 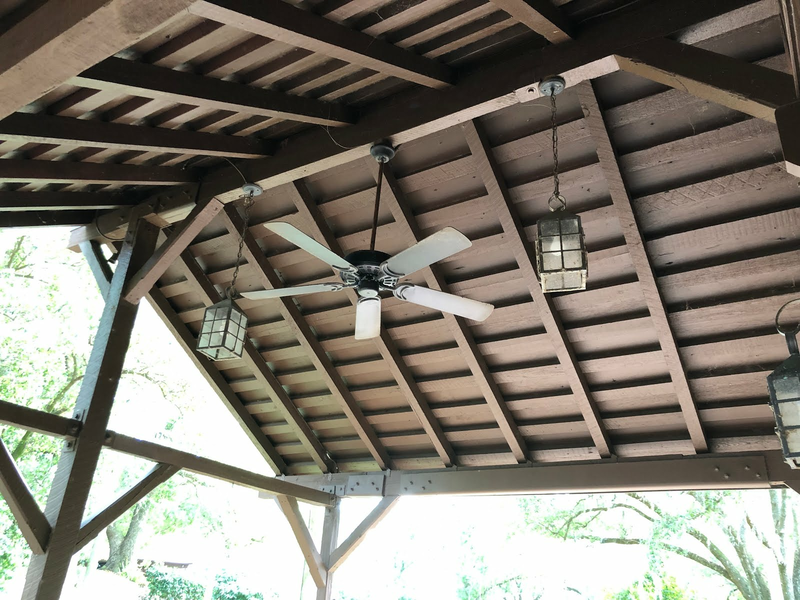 This was done after the purchase was completed. 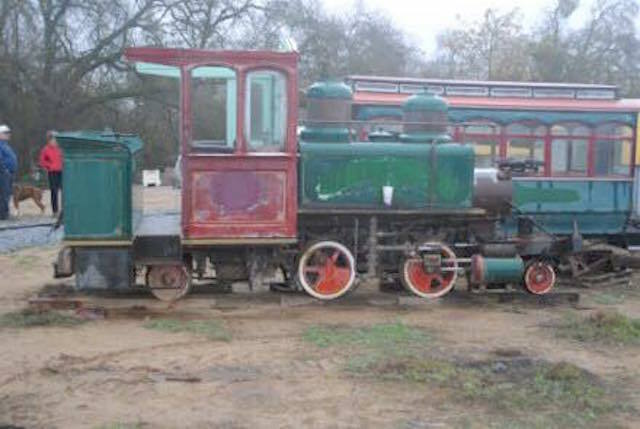 When Malcolm found it, it had been sitting for some time and not running. 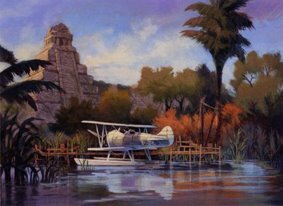 Another owner nearby owned three of these planes and wanted much more money for his as they were flyable. 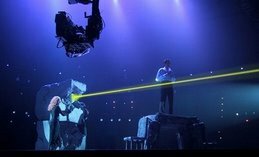 Malcolm didnt need one that flew and bought the cheapest one, being the real on. When the man who owned the three planes found out what he had missed, he was pretty upset at himself, as it had been right next to his backyard." 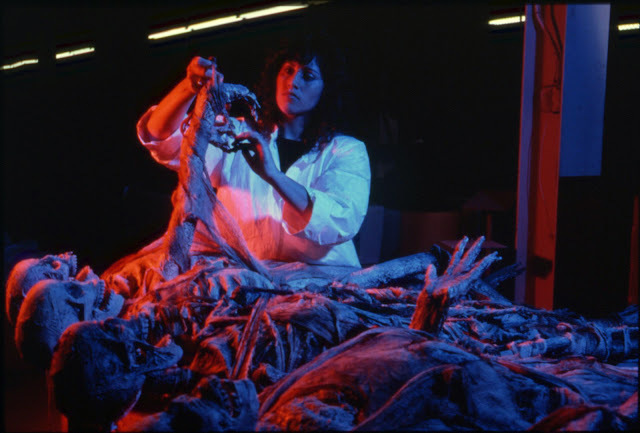 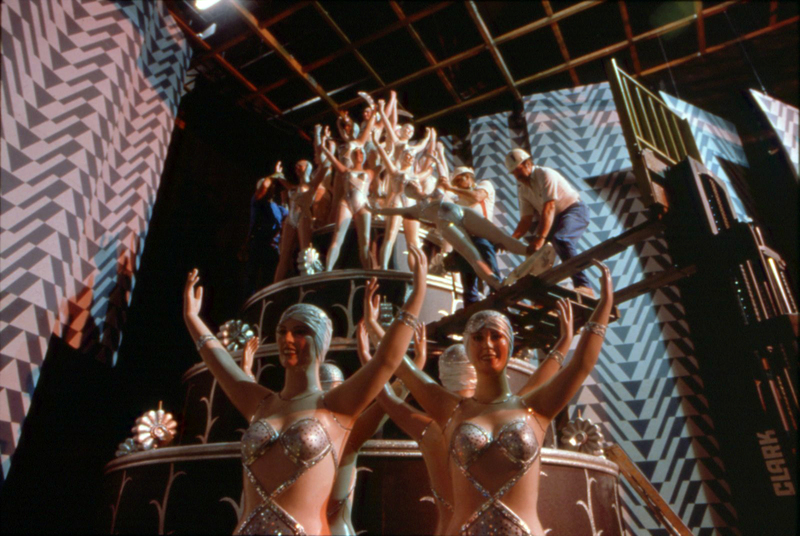 The first behind the scenes picture below shows an imagineer at work on the Busby Berkeley opening scene. 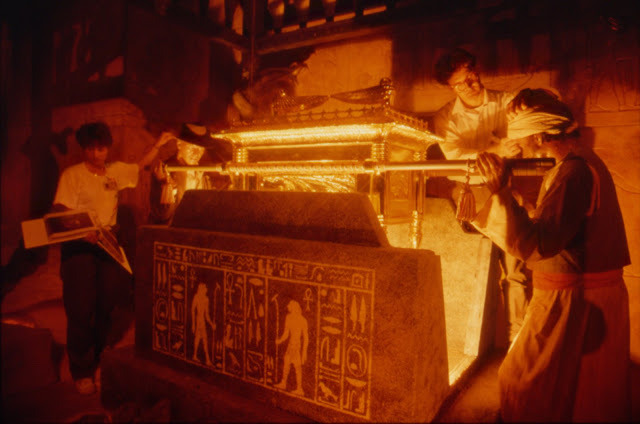 When we think about an Indiana Jones attraction, we generally think about Indiana Jones Adventure, or the Epic stunt spectacular, or the Temple du péril but we often forget that there is a great Indy scene in the Great Movie ride! 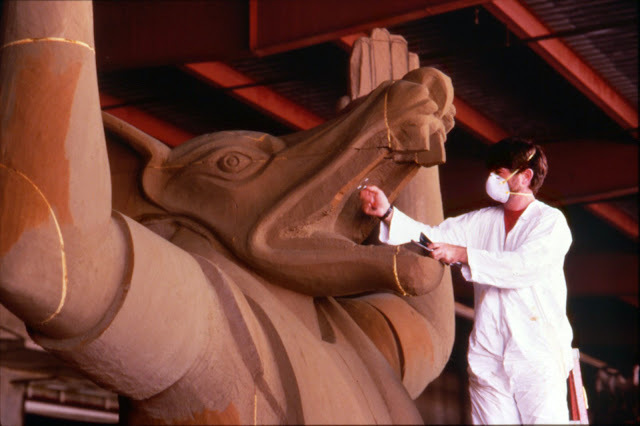 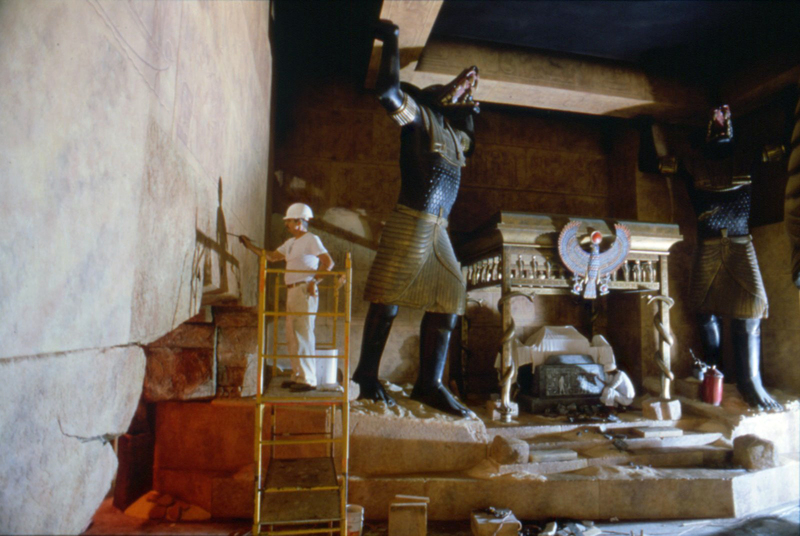 Here, one imagineer is at work on one of the giant Anubis statues. 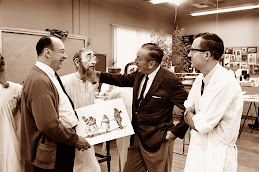 Other imagineers at work in the same room. 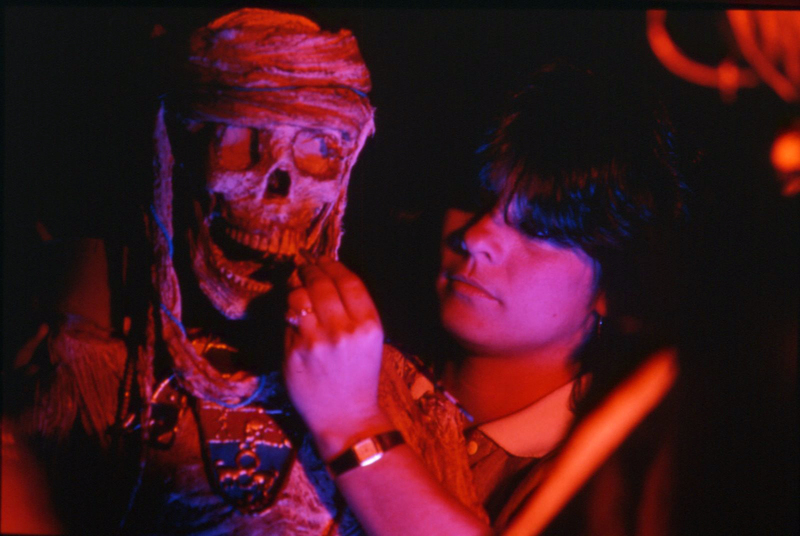 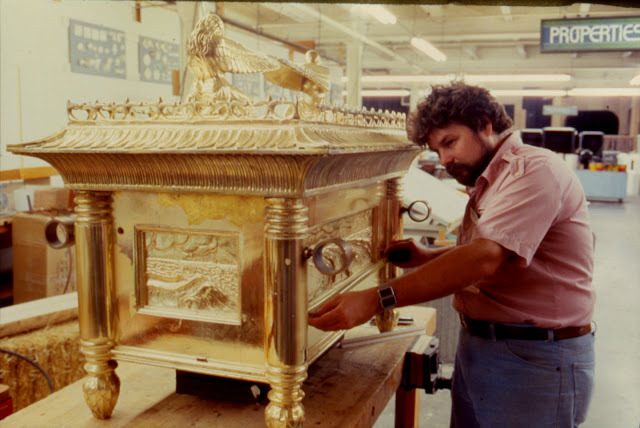 Final touch to the Ark of the Covenant scene. 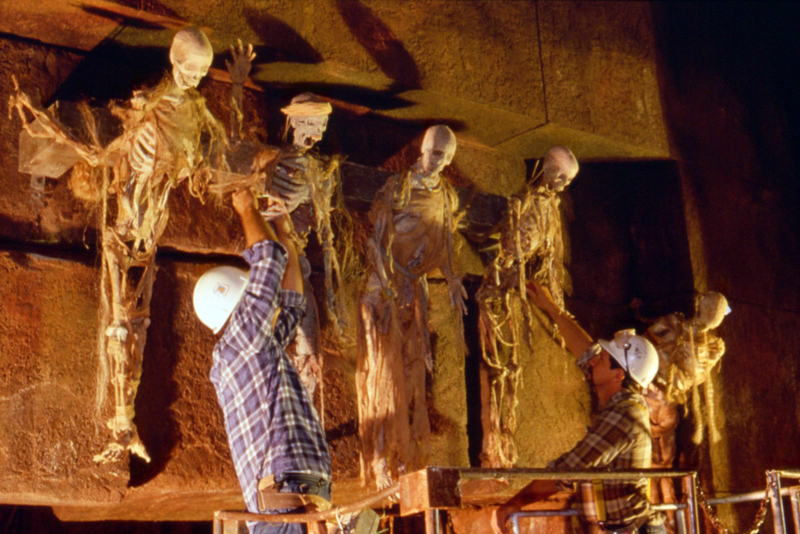 Inside WDI workhouse, an imagineer measuring the beautiful Ark of the Covenant replica. 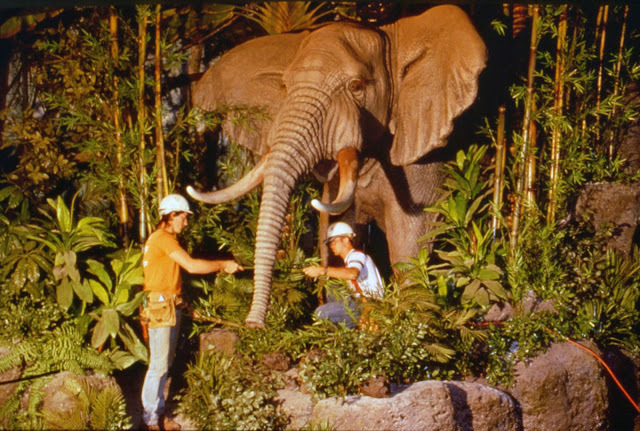 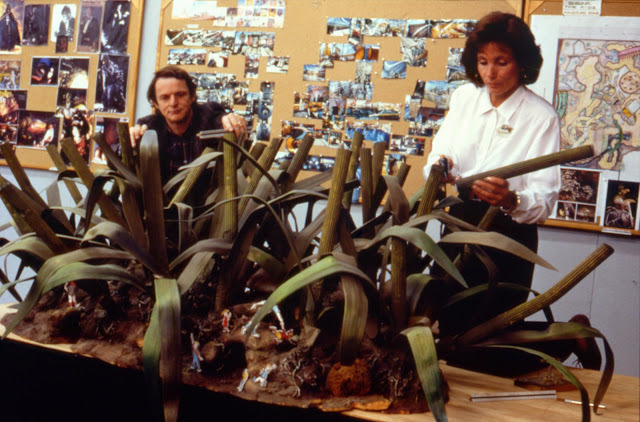 No, it's not Tarzan and Jane, but two imagineers at work on the vegetation of the Tarzan scene. 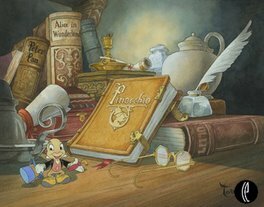 Almost all of the Epcot and Disney Mgm artwork you can see on Disney and more was released to me during WDW 25th anniversary press event by the WDW photo library. At that time it was still possible for the journalists to go at the photo library, choose the slides that interest you and ask if it was possible to get them. 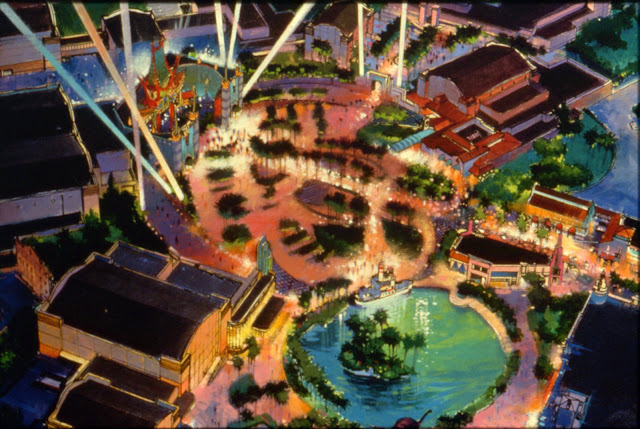 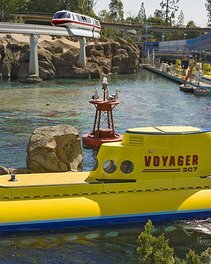 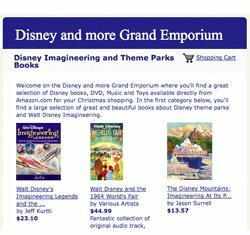 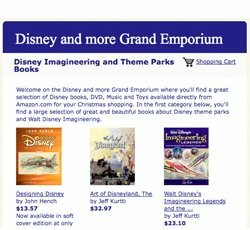 These one needed an approval from WDW Imagineering, but they gave their approval, and that's the whole story. 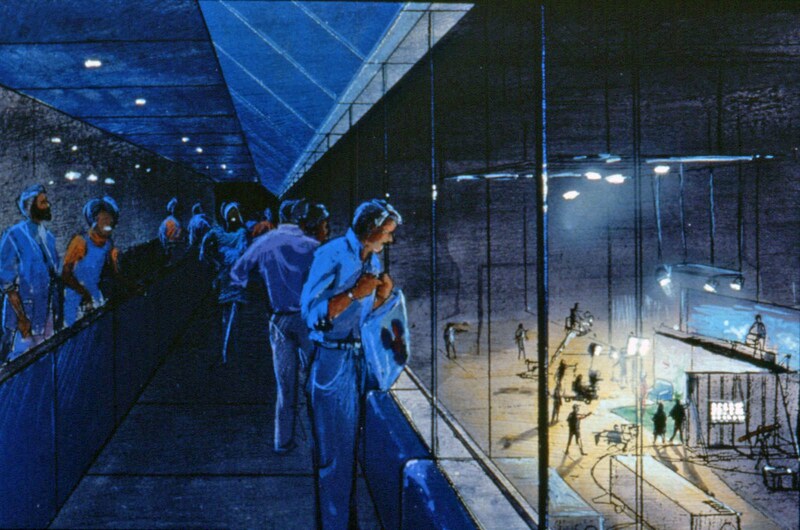 For the choice of the renderings themselves, you just have to thanks my good taste! "Star Wars: Galaxy’s Edge is opening on May 31 at the Disneyland Resort in Southern California and August 29 at Disney’s Hollywood Studios in Florida. 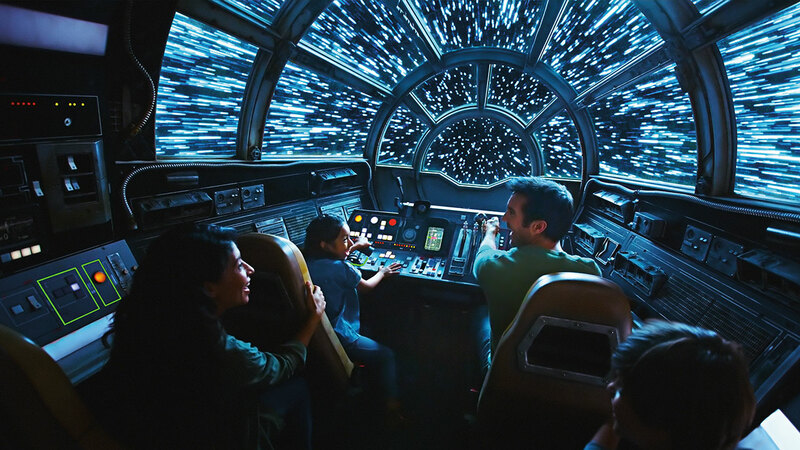 If you are planning to visit Star Wars: Galaxy’s Edge at the Disneyland Resort between May 31 and June 23, 2019, a reservation and theme park admission are required. 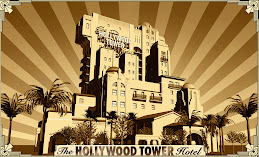 There is no additional cost to make a reservation, but reservations are subject to availability. 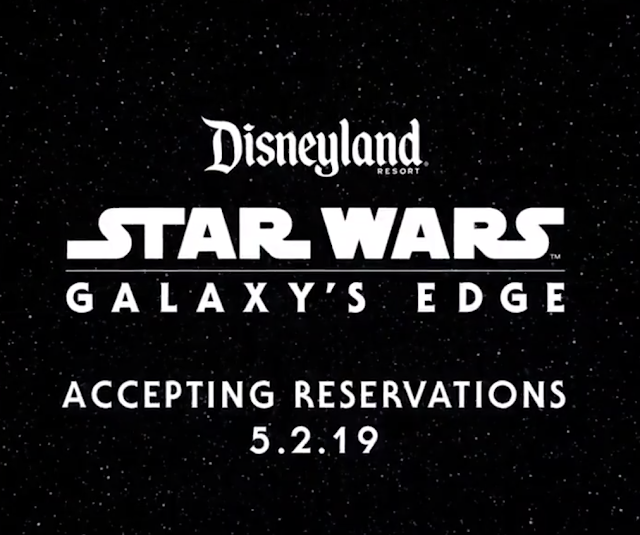 *Guests staying at a Disneyland Resort hotel between May 31 and June 23, 2019 will receive a designated reservation to access Star Wars: Galaxy’s Edge during their stay. 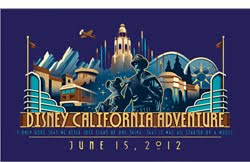 One reservation per registered Guest. 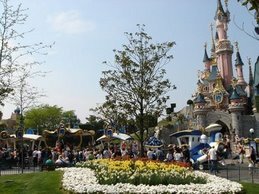 Each Guest is required to have valid theme park admission. If the hotel reservation is cancelled, the Star Wars: Galaxy’s Edge reservation will be cancelled. 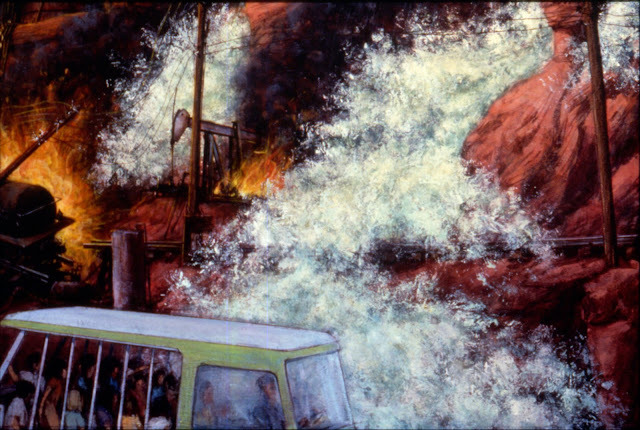 Access to certain experiences in the land are subject to capacity and other factors. 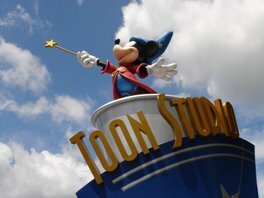 Additional restrictions apply." 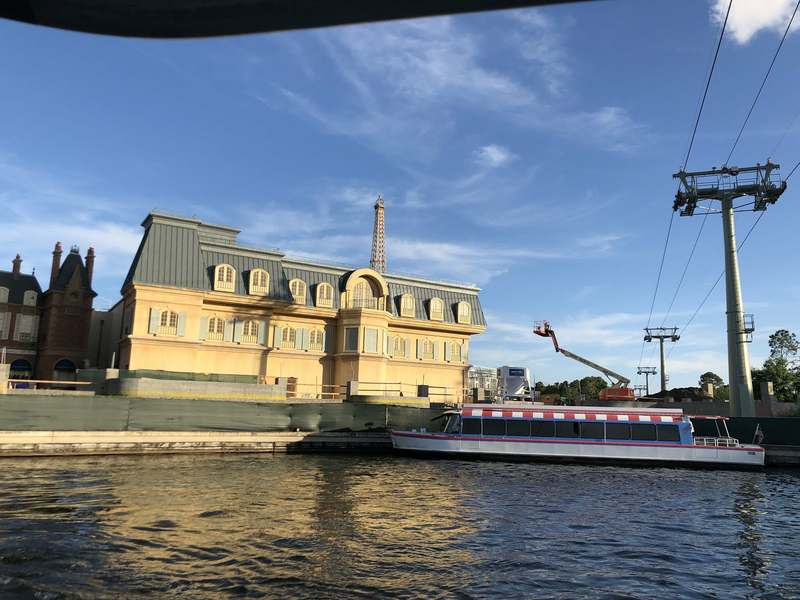 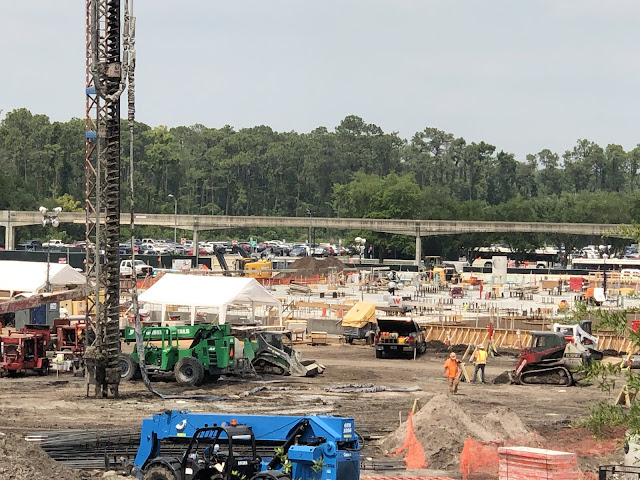 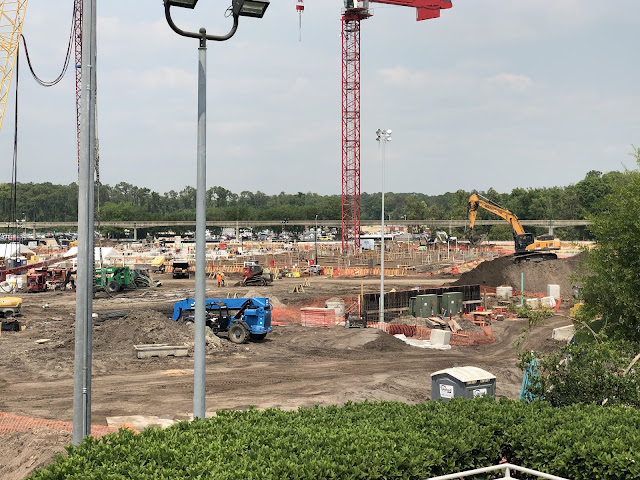 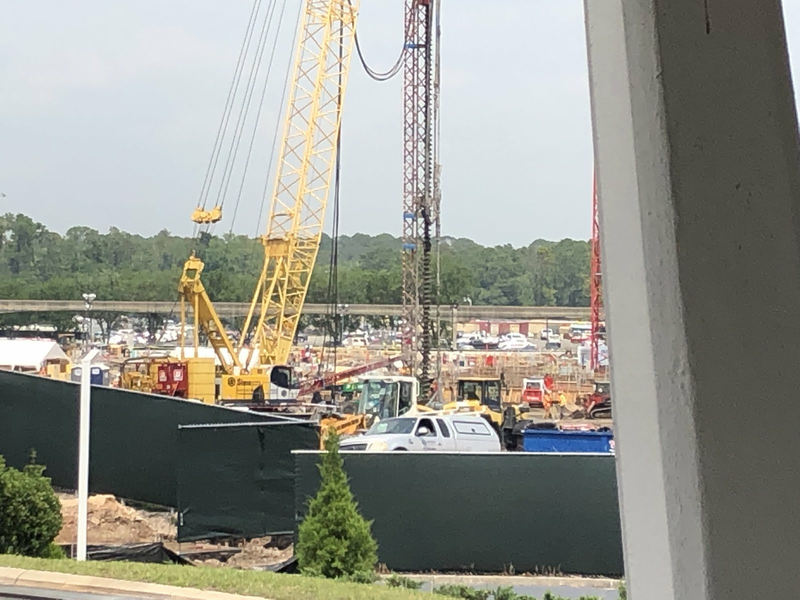 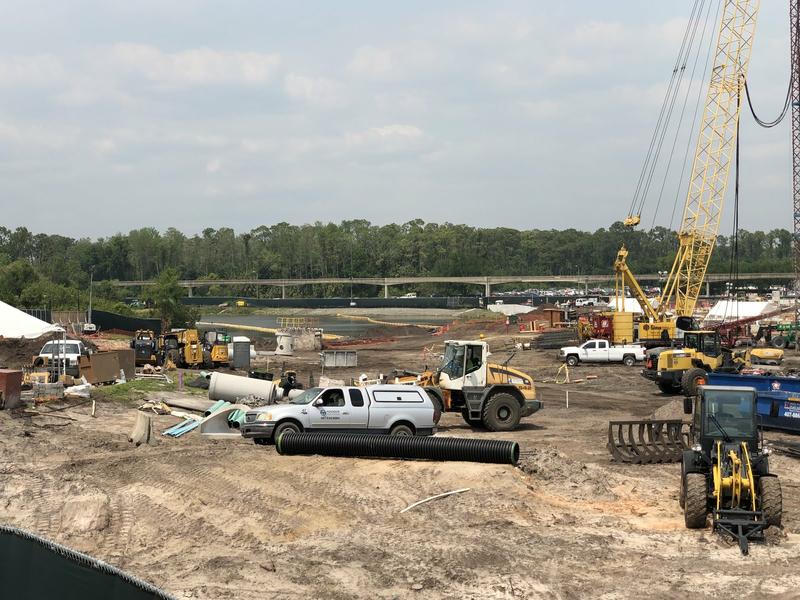 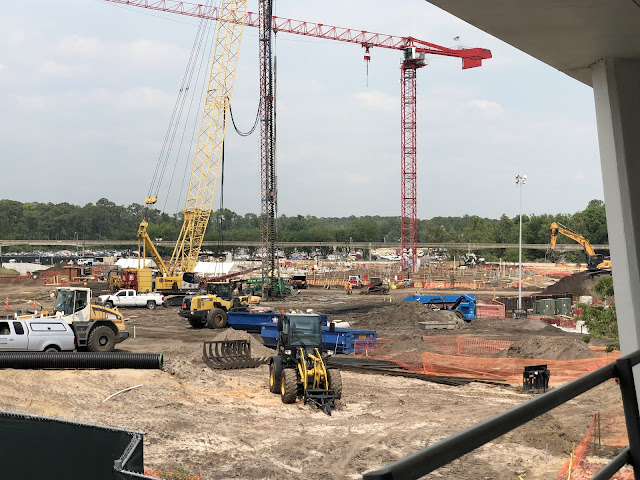 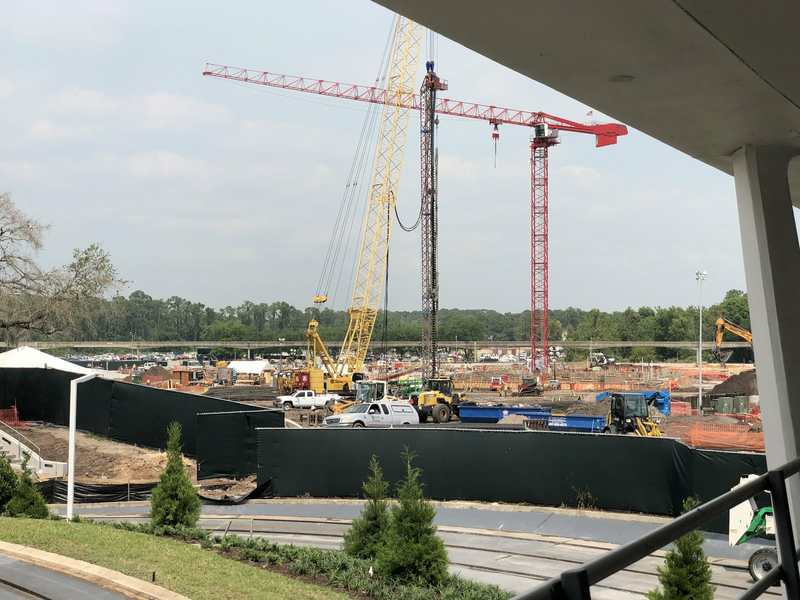 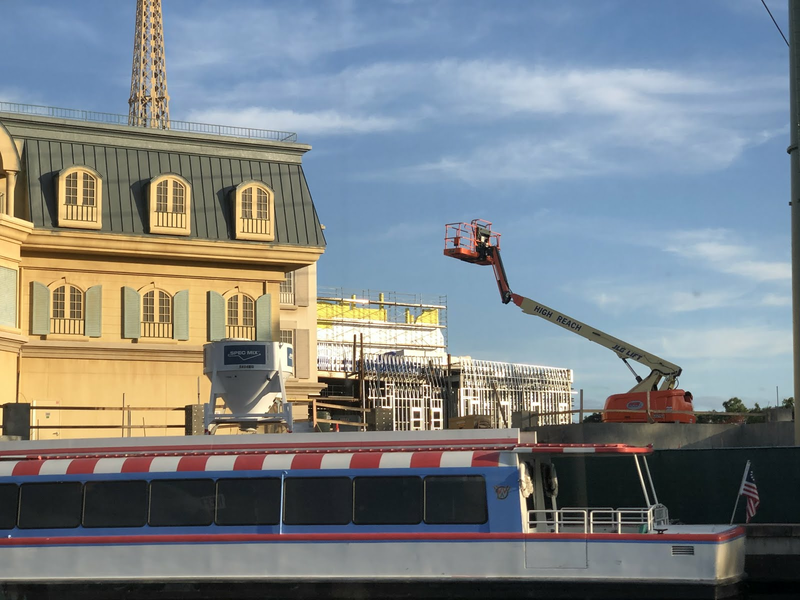 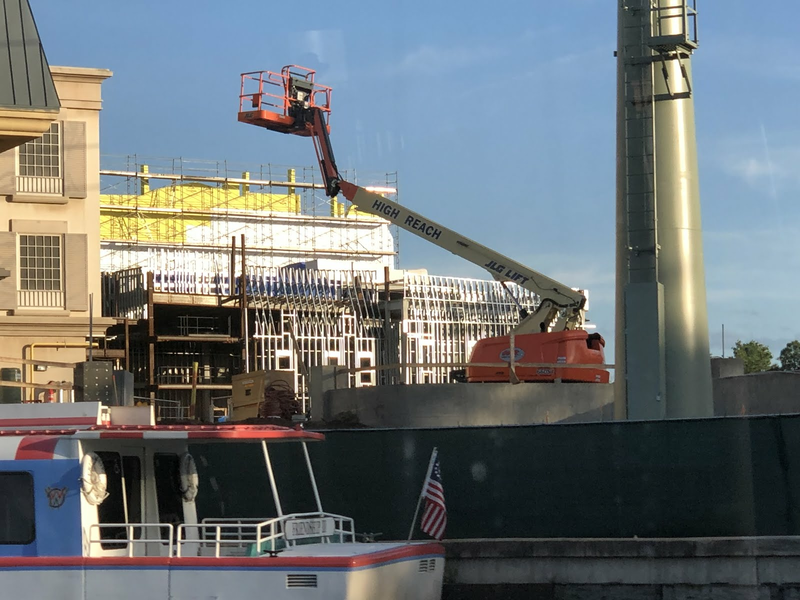 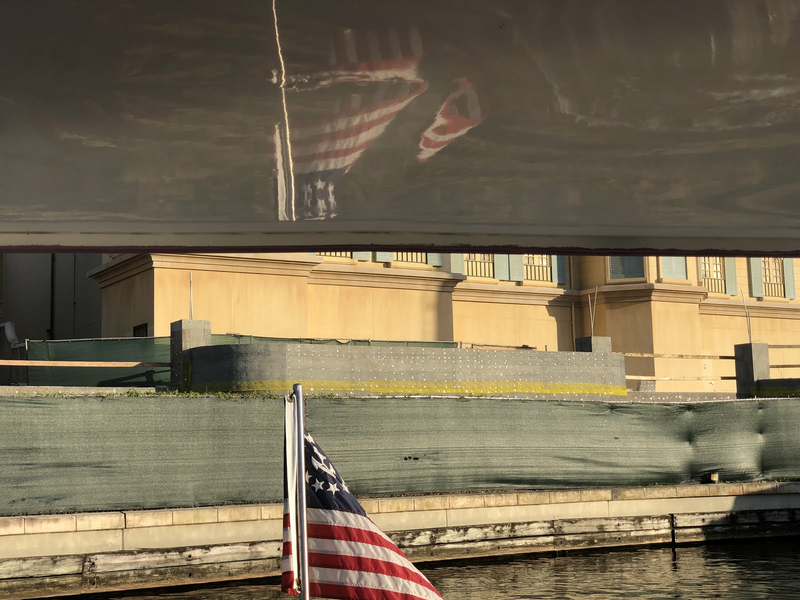 I've got a WDW update for you to start the week with the latest pictures of the TRON Lighcycles construction site, Epcot Ratatouille and more. 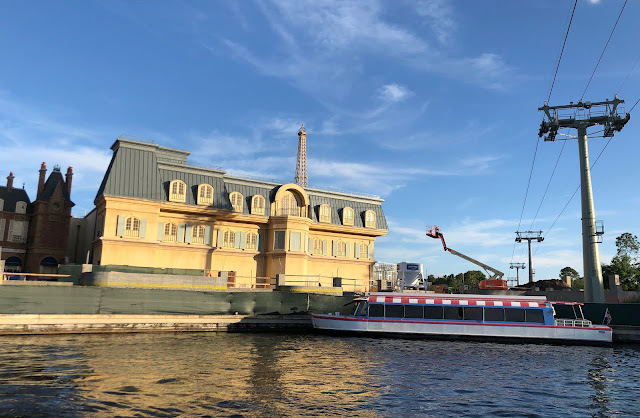 Let's start by Epcot to have a look at the Ratatouille site on a different angle than usual. 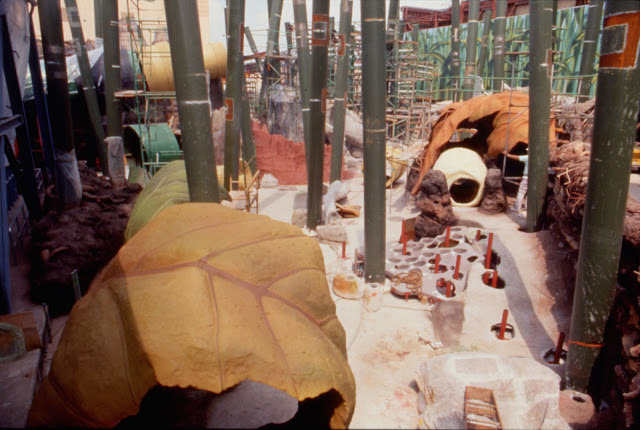 The building facade below is not new. But on the next pics you can see the wall that they are constructing below the facade to make sure guests can not look out of that area of water. Nearby is the new gondolas station for world gateway park entrance. 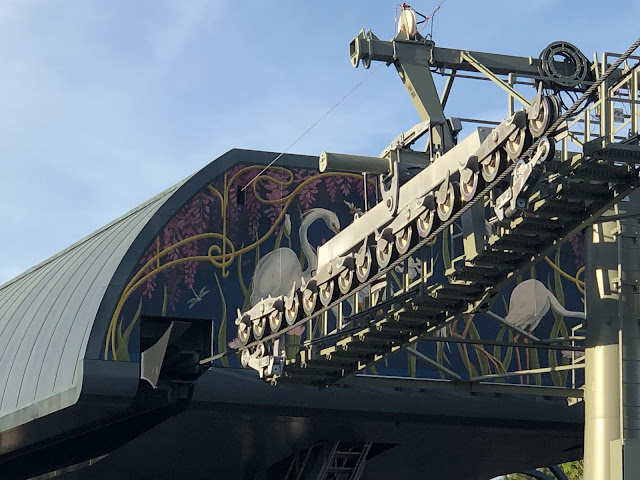 The painting on it looks nice. 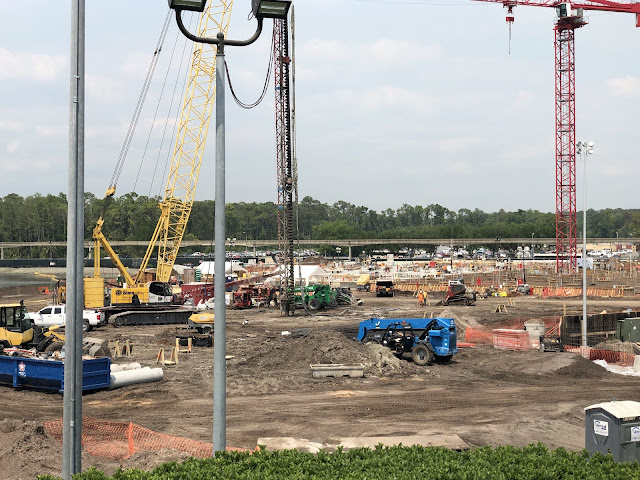 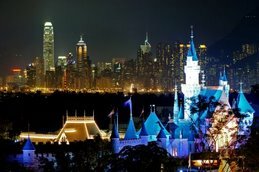 Let's move to WDW Magic Kingdom to have a look at TRON Lightcycles which starts to go vertical on the construction site. 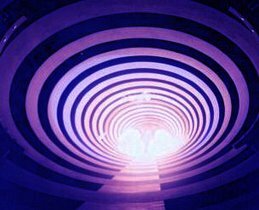 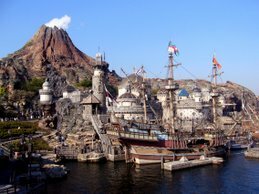 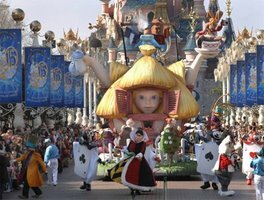 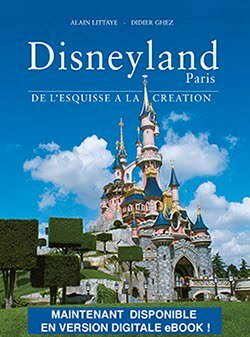 That said, it's not specially interesting right now, which is normal as they are at the start of teh cosntruction of an attraction that won't open before two years. 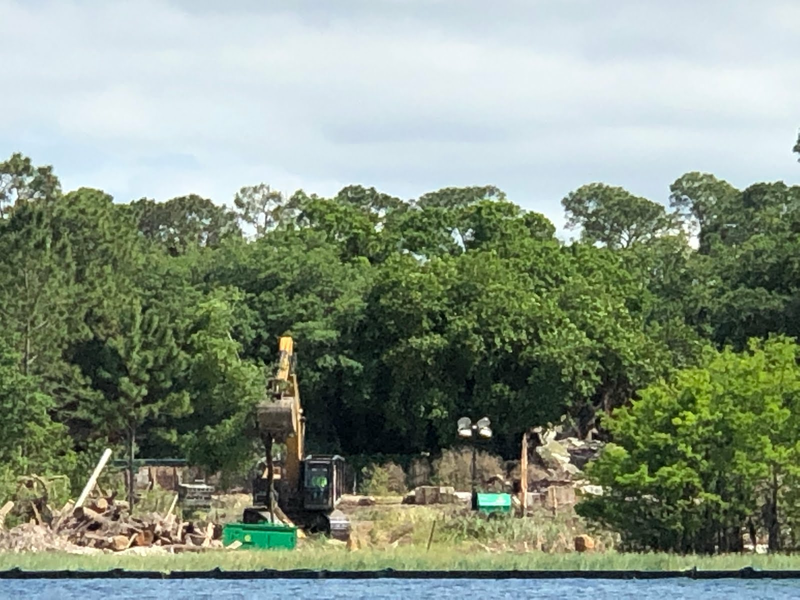 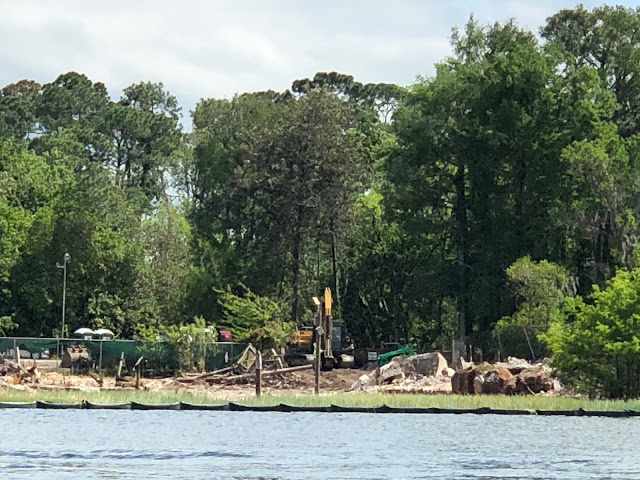 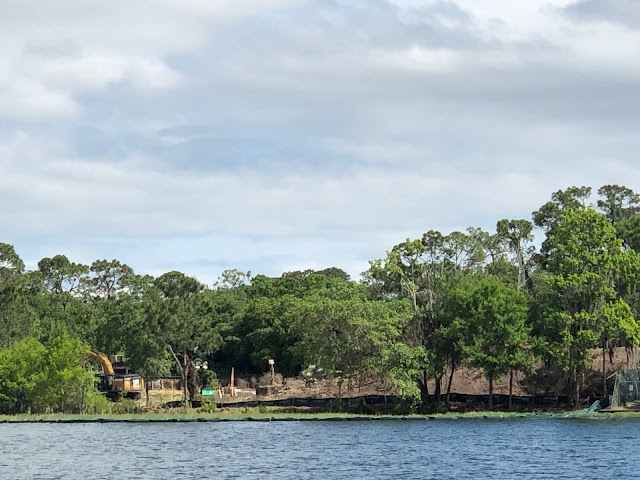 Let's have a look now at the works for the new resort where was a long time ago the now extict River Country, They're currently removing everything that was left and clear the ground for the construction. 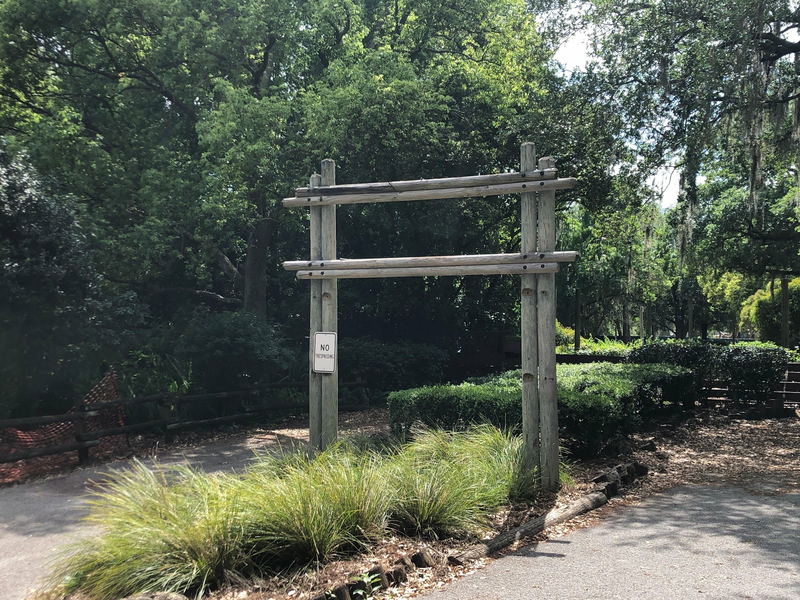 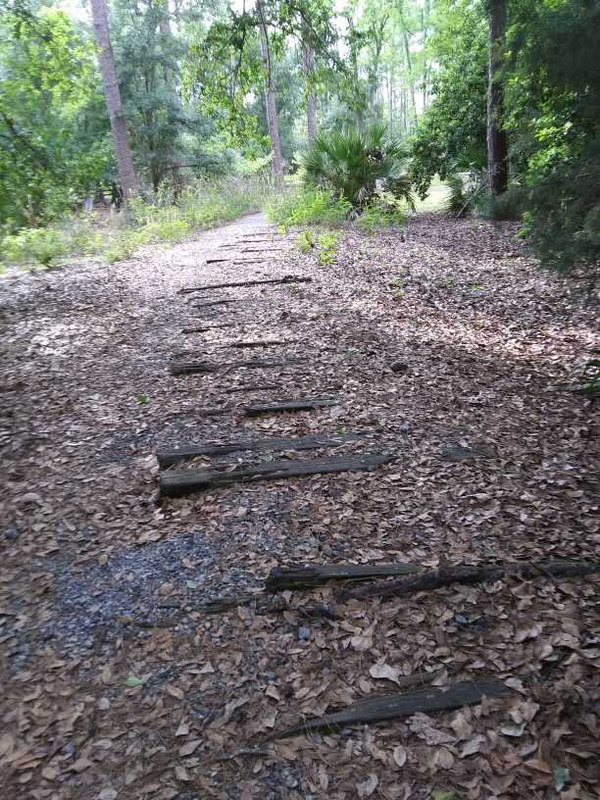 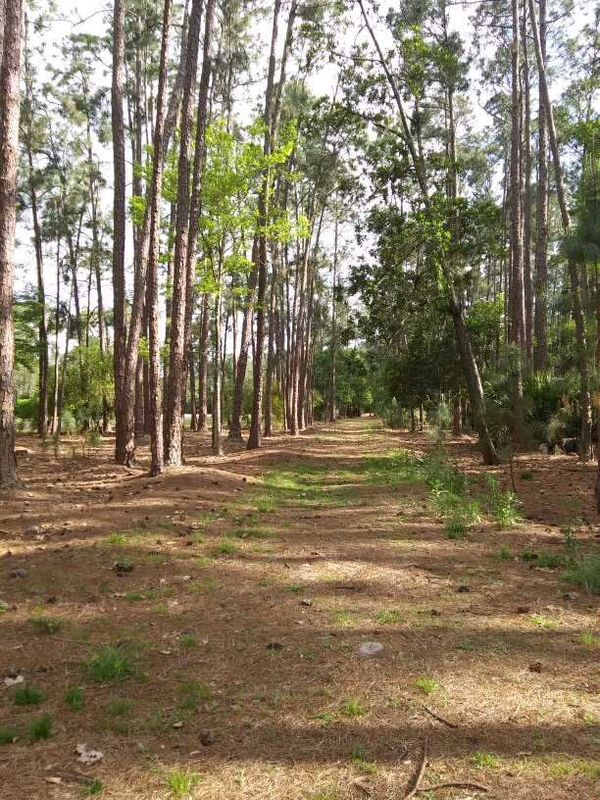 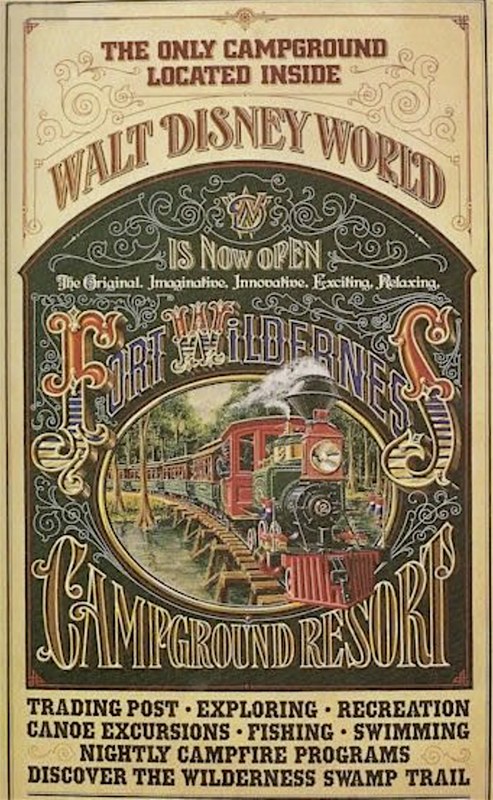 While we're there let's have a look at the River Country / Fort Wilderness area and the picture below shows where was the entrance sign. 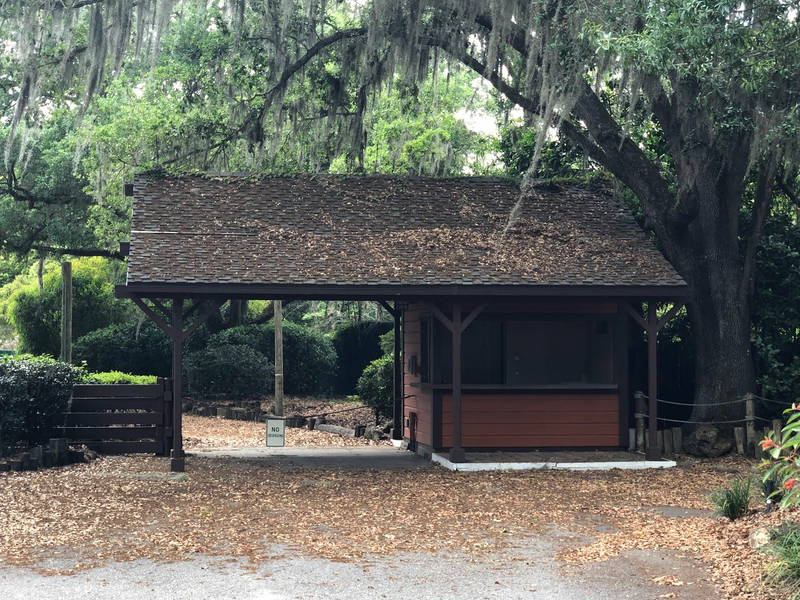 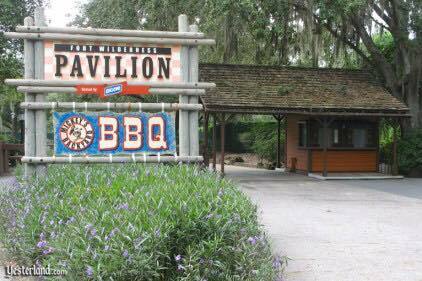 But, wait a minute, on the vintage picture below is written "Fort Wilderness Pavilion / Mickey's Backyard Barbecue", so was it River Country ticket booth, or...? 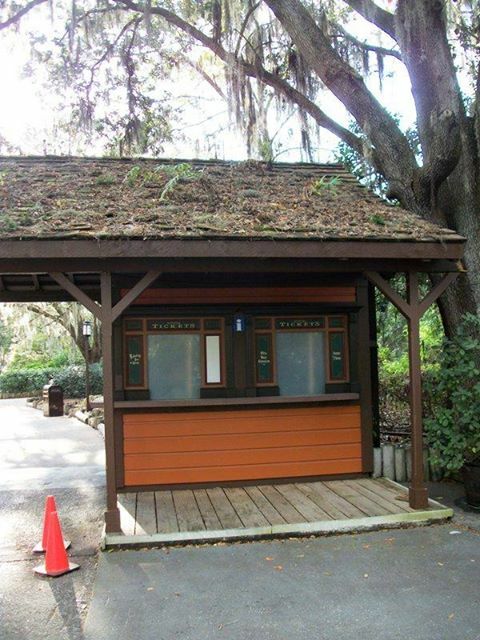 In fact, it was River Country ticket booth as you'll see on the second pciture below and they utilized this area later for the Mickey BBQ but this is the river country area anyway. 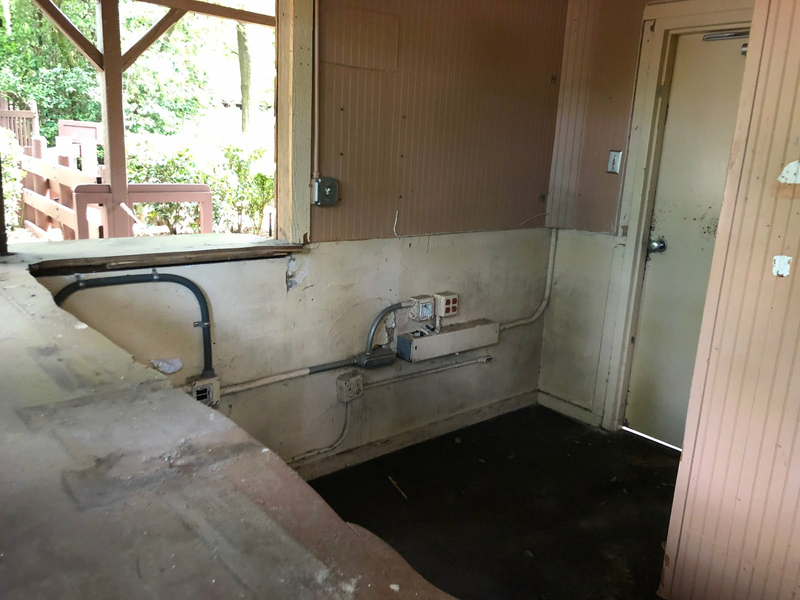 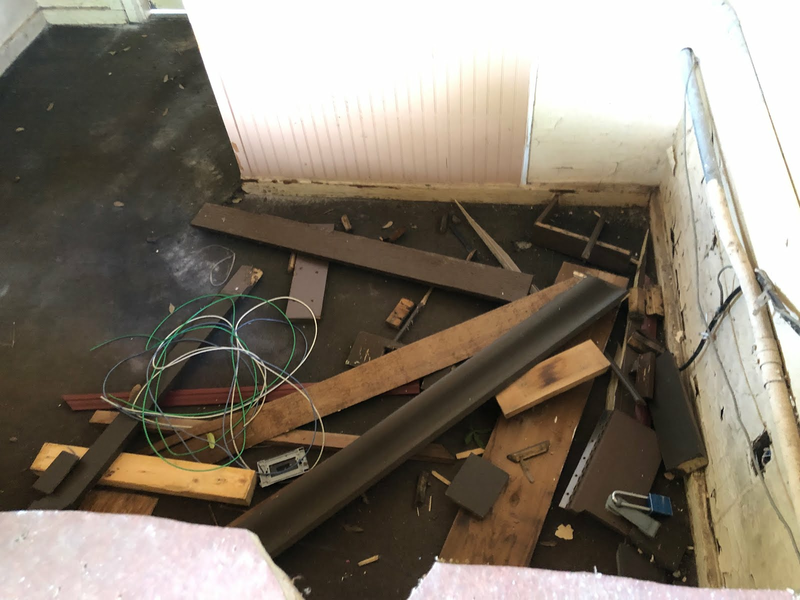 The next picture shows what was the inside of the ticket booth where guests would purchase tickets and now you can see it is old and decaying. 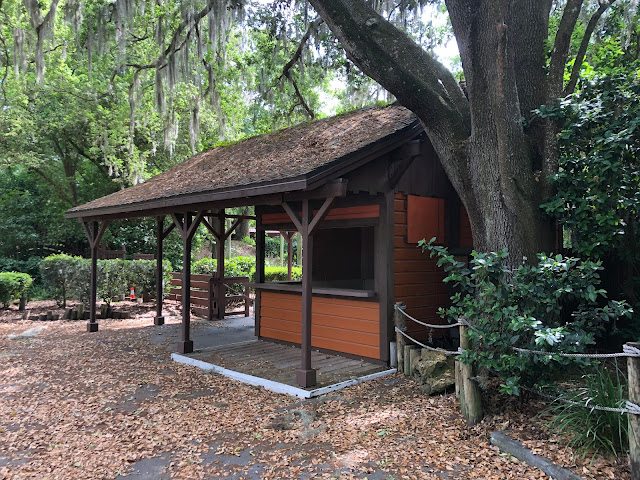 The picture below shows the entrance turnstile roof that is to the left of the ticket booth window. 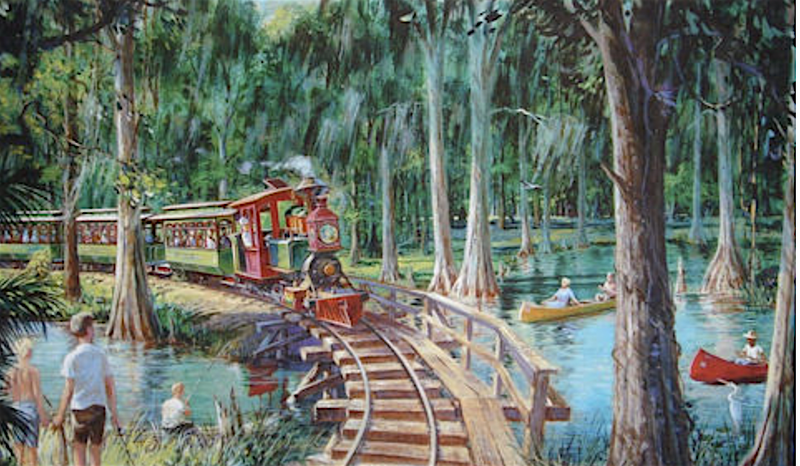 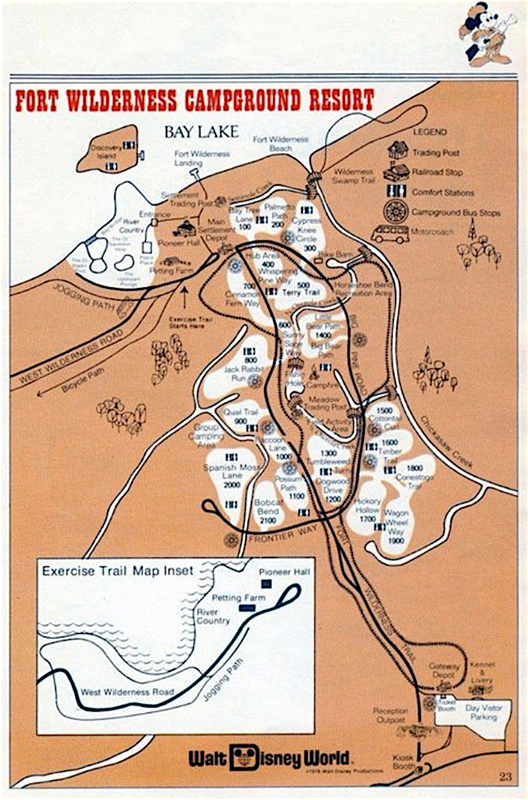 Anyone remember the Fort Wilderness train, also extinct since a looong time? 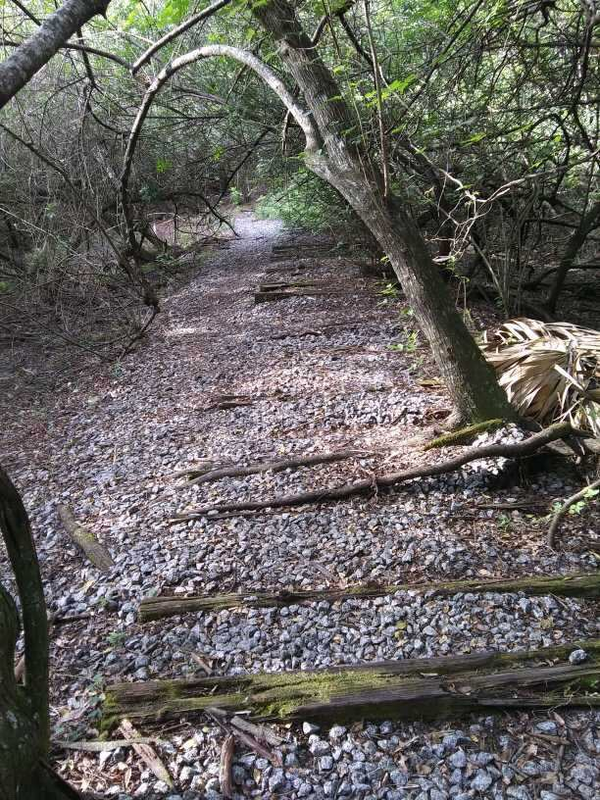 The trace of the train track or the path through which the train was moving is still visible. 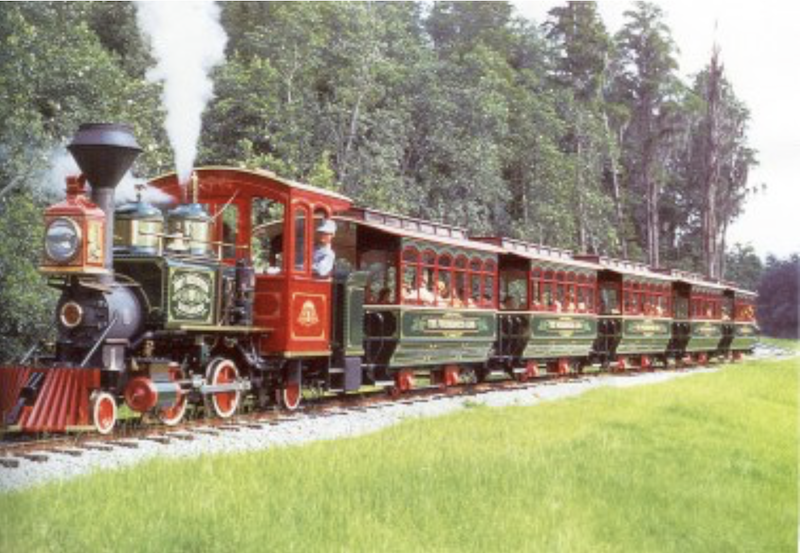 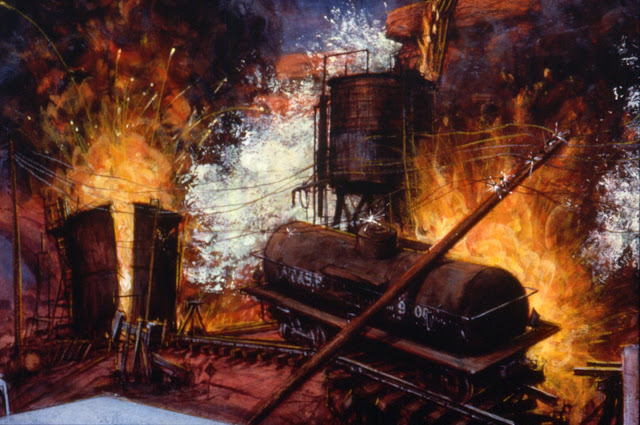 And what happened to the Fort Wilderness train now, you ask? 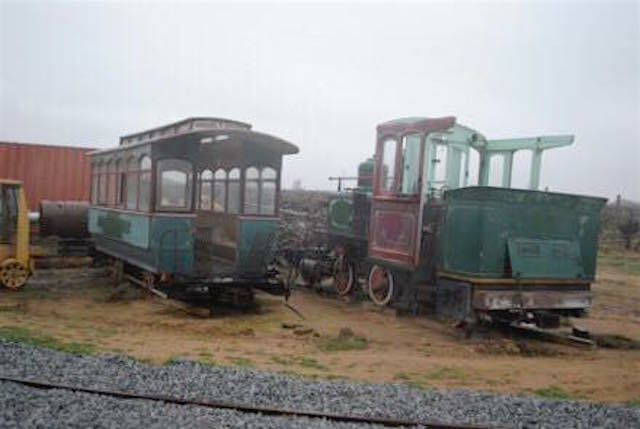 Well the least we can say is that the train is not in good condition, rotting away, as you'll see on the pics below. 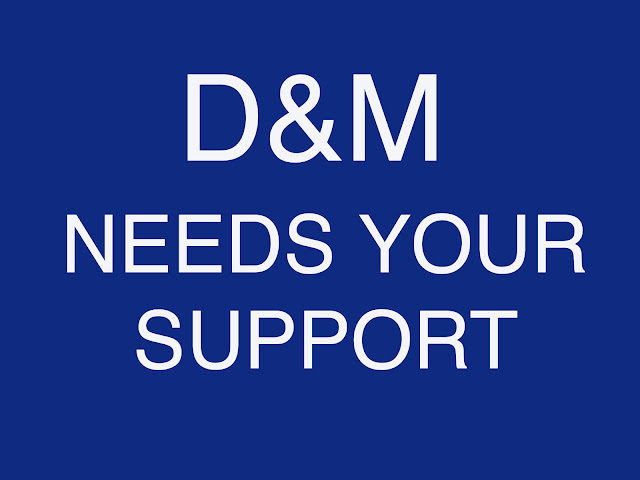 Well, that's all for now, stay tuned on D&M for a new WDW update coming soon!